Has your home been damaged by fire, water, or another element? Whether a hailstorm has caused damage to your home’s roof or a flood has wiped out the basement, Bowles Construction is here to help you get back to a sense of normalcy again. Bowles Construction was established in 1978 by brothers Chris and Greg Bowles merging their two construction companies. Ever since, we’ve served both residential and commercial customers in the Central Savannah River Area whose property has been damaged by fire, water, wind, mold, or sewage. Since time is money in our business, we’re available 24 hours a day to assist in emergency situations. The moment you notice a problem, make the call to Bowles Construction and we’ll be right over. We also make sure to use the latest technology when working so that both your family and our crew are protected during a HAZMAT situation. Well also work with your homeowners’ insurance company to file any needed paperwork in a timely manner for faster processing of your claim. 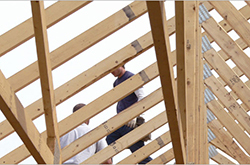 Bowles Construction can handle all areas of home or office remodeling. Whether you’re looking to change up your kitchen or bathroom, add on a room, have a deck constructed, or have a window replaced, make the call to Bowles today. Qualified Remodeler magazine has ranked us as one of the top 500 in the United States each year since 1998. We can also take care of needed repairs on your fascia, soffit, or siding. We’ve been able to build our business in the CSRA since 1978 in large part due to word-of-mouth advertising from satisfied customers. To show our appreciation for this, we offer a referral program. Simply refer someone else to Bowles Construction and we will give you a $25 gift certificate to an area restaurant once they hire us! That’s just one of the many ways we show our appreciation to our customers. Whether you’re looking to remodel your home or office or you need a quick and effective cleanup of water damage from flooding in your office, call Bowles Construction of Augusta, GA. Our crew is local, trusted, and personable. You’ll experience a friendly and knowledgeable crew who will not rest until you say the job is done! We look forward to serving you.